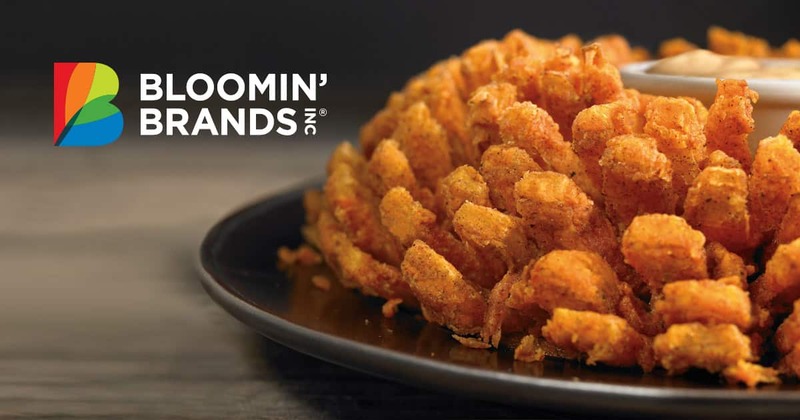 How would you rate your experience with Bloomin' Brands ? 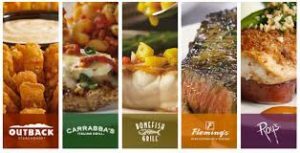 Bloomin’ Brands can trace its roots back to 1988 when friends Tim Gannon, Bob Basham, and Chris Sullivan decided they wanted to create a casual dining restaurant that had a laid-back theme and incredible food. The original name of their company was Multi-Venture Partners, Inc. The company opened their first restaurant in Tampa, Florida, and named it Outback Steakhouse. The chain was incredibly successful and the company went public on the NASDAQ in 1991, with a total of 49 locations. It was at this same time that the name was changed to Outback Steakhouse, Inc.
A new chain, Carrabba’s Italian Grill, was acquired in 1993. In 1998 the first locations of Roy’s Restaurant, Fleming’s Prime Steakhouse & Wine Bar, and Lee Roy Selmon’s open. Annual revenue hits $1 billion in 1999. Outback Steakhouse went international when the first location opened in Canada. The company acquired Bonefish Grill in 2001. In 2002, Cheeseburger in Paradise was acquired. The company changed its name to Bloomin’ Brands in 2006. 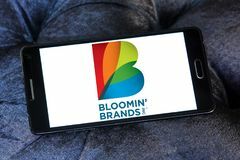 Today, Bloomin’ Brands is one of the world’s largest casual dining companies with approximately 100,000 employees and close to 1,500 restaurants throughout 48 states, Puerto Rico, Guam and 19 countries. Annual revenue in 2017 was $4.213 billion. Company headquarters remain in Tampa, Florida. Question 1: What is the phone number for Bloomin' Brands? 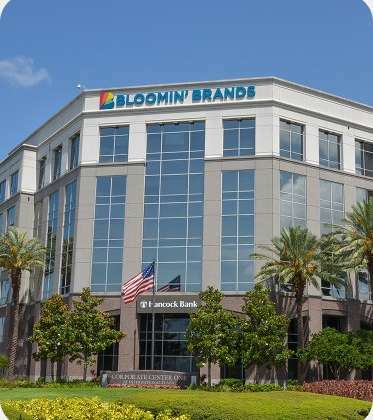 Answer 1: The phone number for Bloomin' Brands is (813) 282-1225. Question 2: Who is the CEO of Bloomin' Brands? Answer 2: The CEO of Bloomin' Brands is Elizabeth Smith. Question 3: Who founded Bloomin' Brands? Answer 3: Bloomin' Brands was founded by Tim Gannon, Bob Basham, and Chris Sullivan in 1988. Trouble is the only work I can use. My experience at the restaurant was very disappointing. Not only is your restaurant a disappointment, but also your customer service department. You give a contact number but you receive a message that the box is full and cannot accept messages. This along with the restaurant also proves that your headquarters done not care about customer complaints. I think that anytime a customer can leave an amount of $60.00 their complaint should be heard. I don’t know if you will have the courtesy to reply or not, but I will make sure those that I know will hear about my experience. I think it only fair seeing I cannot reach your complaint department. I just wanted to email you guys to talk about a private matter, but there is zero email information all that is listed is -email: email bloomin brands. There is no actual email listed and the voicemail is full. I’ve been calling for days now. Is anyone there? Yesterday (2-18) myself, wife, daughter and mother went to the Outback Steakhouse on Bethel Road (Columbus Ohio) for dinner around 6:30 pm. We were promptly seated. I haven’t been to an Outback for well over a year as the quality of the food at this location seems to be getting worse. The Outback used to be one of my favorite restaurants – but after last nights experience – I won’t return and it will take some doing for me to try another location. Back to the meal – I ordered a large Fosters on tap – nope – can’t do that the taps are not working. So I was able to get an Oil can. Ordered drinks and two appetizers (cocnut shrimp overcooked (and too little dipping sauce). Now we order our meals. I want a bone in rib eye – nope not available. OK How about a 14 ounce rib eye? Nope not available. Hoe about a porterhouse – nope not available – but we do have sirloin and strip steak. So I get a 10 ounce ribeye. My daughter orders a 6 ounce filet – nope don’t have that – how about a 10 ounce filet – nope don’t have that either.. If this is the type of experience you want customers to take away it won’t be long before Outback goes the way of the Ponderosa Steakhouse. Again – it may be this particular location – but I am very leery of chancing it at another location.with the past experiences I have hat at the Bethel Road location. Want to make sure Bloomin' Brands sees your comment or complaint?